Christian “Chimpa” Gonzalez (18-1, 15 KOs) confirmed yet again that he is one of the best and brightest prospects of the exclusive Golden Boy Promotions stable with a hard-earned eight-round unanimous decision victory against former WBC Super Featherweight Champion Gamaliel “El Platano” Diaz (40-18-3, 19 KOs) of Michoacan, Mexico in the main event of the latest edition of LA FIGHT CLUB at the Belasco Theater in Downtown Los Angeles and televised live nationally on Estrella TV’s Boxeo Estelar. The charismatic knockout artist of Buena Park, Calif. won with scores of 79-72, 79-72 and 76-75 in a tough fight held in the super lightweight division. VIP fighters for tonight’s event included Oscar “El Jaguar” Negrete, Niko “Baby Face” Valdes, Charles Huerta and Joet Gonzalez. In the co-main event, Edgar “Kid Neza” Valerio (12-0, 7 KOs) dropped Martin Cardona (24-9, 16 KOs) a total of three times to win via second-round knockout in a scheduled eight-round featherweight fight. In the opening round, the native of Los Angeles, Calif. scored two knockdowns, the second of which was caused by a left uppercut that sent Cardona flying across the ring. Cardona, of Tucson, Arizona, managed to survive the first round, but only for Valerio to catch him with an overhand right to the temple that immediately ended matters at 21 seconds of the second round. 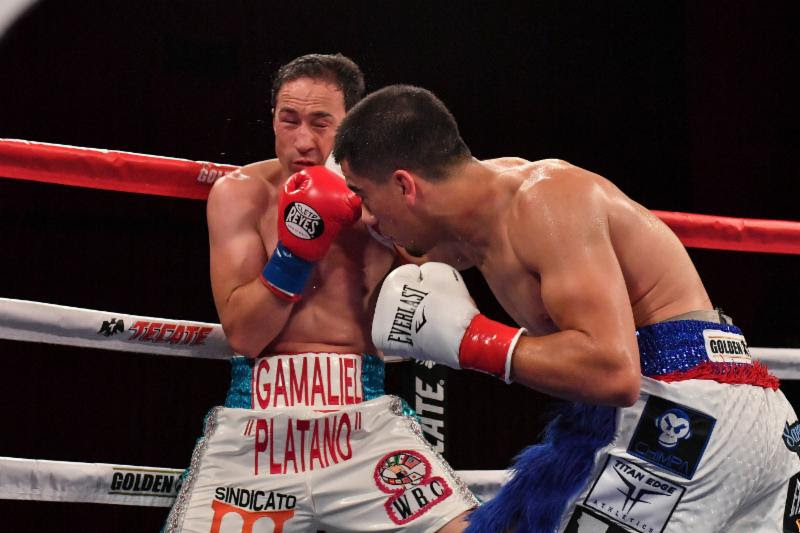 Lightweight prospect Jousce “Tito” Gonzalez (6-0, 6 KOs) opened the Boxeo Estelar transmission with a first-round technical knockout victory against Ricardo Fernandez (3-7-4) of Ciudad Juarez, Mexico in a scheduled eight-rounder. Gonzalez, who is extremely good at bending his knees to get the most amount of leverage possible from his punches, dropped Fernandez hard in the opening seconds before stopping him a few combinations later at 2:10 of the first round. In the first bout of the evening, Ferdinand Kerobyan (6-0, 3 KOs) of North Hollywood, Calif. scored a first-round knockout victory against Uriel Gonzalez (1-2-1) of San Diego, Calif. in a scheduled six-round super welterweight fight. Keroyban stalked Gonzalez in the opening seconds of fight and hurt him with a right hand that immediately reddened his face. Then, Keroyban landed a hard counter left hook to the body of Gonzalez, sending him reeling back before unleashing a series of left hooks to the chin that knocked him down immediately. Gonzalez could not make it back to his feet before the count, forcing the referee to call the fight at 1:08 of the first round. Gonzalez vs. Diaz was an eight-round super lightweight fight presented by Golden Boy Promotions and sponsored by “TECATE, THE OFFICIAL BEER OF BOXING” and Casa Mexico Tequila. The event was held at the Belasco Theater on Friday, October 6. Videos and images are available for download by clicking here or copying and pasting the link: http://bit.ly/LAFightClubOct6. Credit must be given to Golden Boy Promotions for any photos/video. www.facebook.com/EstrellaTVNetwork, visit us on Instagram at @GoldenBoyBoxing, @belascola and @EstrellaTV, follow the conversation using #LAFIGHTCLUB and #BoxeoEstelar.